Attitude → motivation is about setting up an approach that promotes personal growth and purpose by changing the ways how people think and feel. "It is their self-confidence, their belief in themselves, their attitude to life – be it positive or negative. It is how they feel about the future and how they react to the past," ~ Richard Denny. 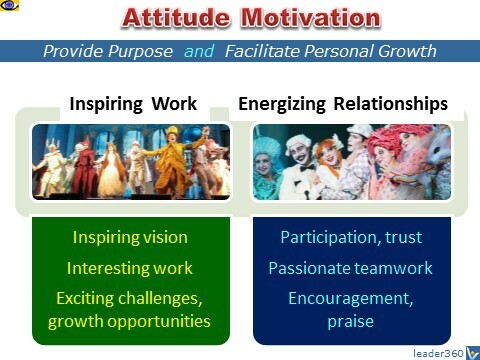 How are people motivated? How can they be inspired to do great things? Everyone wants to make money, but the things that are really important to people are not monetary. Every person needs to know that they are important and "they matter". People wish to be treated well, feel valued and respected, be proud of the place they work, and get satisfaction from what they're contributing. Think about how can you motivate and inspire people by valuing them and recognizing their contribution if you wish to see the amazing value of just making someone feel important and loved. Financial rewards, such as performance bonuses and an equity stake in the financial results, do encourage people to conserve resources and produce results. But the kind of ownership that really generates energy is not economic. It is emotional. It gives people a sense of responsibility and makes them feel that their actions make a difference. Great leaders generate a spirit of teamwork and create a mutual learning and coaching environment that gives people a sense that they are a valuable member of the team and create a feeling that "we are all in this together, and we will succeed of fail, based on the actions of each person," says Noel M. Trichi, the author of The Cycle of Leadership. The one-on-one relationships that individual workers have with their managers, and the trust, respect, and consideration that their managers show toward them on a daily basis are also at the core of an energized workforce.